by Rob - February 6th, 2015. Ten years ago today I finished writing my last short story ever (“Biding Time”); I said then that I was giving up short fiction for good, but people refused to believe me. Well, it’s been a decade now, folks, and I’m showing no signs of fictive recidivism. 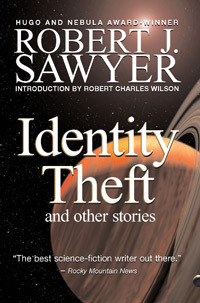 I had a nice little career as a short-story writer, with 44 stories published, now all collected in two volumes — Iterations and Other Stories and Identity Theft and Other Stories. The stories first appeared in a mix of classic genre venues such as Analog, Amazing Stories, and On Spec, original anthologies, and places that don’t normally publish fiction, such as The Toronto Star, The Globe and Mail, Leisure Ways, and The Village Voice. My stories were nominated for the Hugo, Nebula, and Bram Stoker Awards; won Science Fiction Chronicle‘s Reader Award for best short story of the year; won Analog‘s Analytical Library Award for best short story of the year in that magazine; won five Aurora Awards; won France‘s and Spain’s top SF awards; and won an Arthur Ellis Award from the Crime Writers of Canada. I had a story in the journal Nature; had a story read on CBC Radio; had a story produced as a planetarium starshow; had stories optioned for film; and had work reprinted in Hartwell’s Year’s Best SF and in The Penguin Book of Crime Stories. 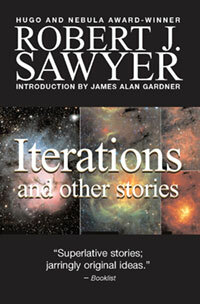 Sawyer’s collection showcases not only an irresistibly engaging narrative voice but also a gift for confronting thorny philosophical conundrums. At every opportunity, Sawyer forces his readers to think while holding their attention with ingenious premises and superlative craftsmanship. But I’m a busy guy, and I can’t do everything. In the past 10 years, I’ve turned down numerous short-fiction commissions, including several from glossy magazines at a dollar a word or more. I’m content concentrating on novels and scriptwriting, but I’m still very proud of the work I did at shorter lengths. Also, see my thoughts from five years ago, on the fifth anniversary of me giving up short fiction, on why I decided to kick the habit. Good ones are to novels as bonsai are to trees. Might as well go ahead and grow the tree. It’s easier to pay the rent with trees. I don’t see Nook or Kindle versions at the online stores. Please let your publisher know that you have fans who want to read these on their e-readers. I’m mostly there with you. I think short stories are a great way to hone one’s craft. But I also think they’re a legitimate form in their own right, not just a poor-man’s novel. It’s a different form factor, and perhaps shouldn’t be compared directly with novels. It certainly seems easier to “pay the rent with trees”. Though, I live in a rainforest, but I still go to Dr. Sun Yat-Sen Garden to look at their bonsai collection. I’m glad you’re doing what you want though. If that’s novels, then stick with it. I’ll read anything you write, no matter the length. Ten years ago, the teenaged me discovered you through your short stories, which rekindled my love of reading and writing, which eventually led to me making my first short story sale recently. For what it’s worth, I really enjoy your short stories.